Aim of Study: To describe the endodontic treatment of 4 cases of differing anatomical complexity using the novel WaveOne Gold® reciprocating single-file system. Case Series: 4 patients were referred for endodontic treatment of teeth 17, 37, 47 and 46. The root canals were cleaned and shaped using mechanized Pathfile instruments with continuous rotary movement and then reciprocating movement using the WaveOne Gold single-file system. The irrigants used were a solution of 5% sodium hypochlorite (NaOCl) and 17% Ethylenediaminetetraacetic acid (EDTA). Conclusion: WaveOne Gold reciprocating single-file system represents an advance in root canal preparation. Their flexibility and cutting capacity make the mechanical preparation of curved canals safer, faster and easier than other instruments. In the cases we describe, the instrument was able to maintain the original shape of the root canal and did not present fractures in any of the cases. Endodontics, Root canal therapy, Tooth root, Radiography. In the last several years mechanical devices and techniques have been developed to further improve the effectiveness of the instrumentation process and facilitate root canal preparation. The most important advance is the modification to the heat treatment of the M-Wire to develop the new gold alloy . The gold technology is achieved when the instrument is warmed and then cooled slowly once the file is made, unlike the MWire technology. This metallurgical treatment gives the characteristic golden appearance to gold instruments  and greater flexibility than the one achieved by nickel titanium (NiTi) and M-Wire instruments . Recently, the system with a reciprocal movement of a WaveOne Gold® single file (Dentsply Tulsa Dental Specialties, Tulsa, OK, USA) was launched. The system is available in four sizes: small (size 20, conicity 0.07), primary (size 25, conicity 0.07), medium (size 35, conicity 0.06) and large (cone size 45, conicity 0.05). Its noteworthy features include a cross-sectional shape in a parallelogram with two edges, an 85º cutting angle, which according to the manufacturer improves the cutting ability and elimination of residues . In addition, the reciprocating movement through which it is activated alleviates stress on the instrument by using counter clockwise movements (cutting action) and clockwise movements (release of the instrument), extending its durability and increasing its resistance to cyclical fatigue compared to systems that use continuous rotation . WaveOne gold is a promising system in root canal preparation; however, to date few studies have been published. In addition, most of those studies have been in vitro. This article presents the endodontic resolution of a case series using the WaveOne Gold single-file reciprocating system. 49-year-old female patient: No relevant medical history, consulted for pain in the right maxillary zone when chewing. The clinical examination revealed extensive metallic restoration in the upper right second molar (17). There was no response to hot and cold pulp sensitivity tests; response was exaggerated on vertical as well as horizontal percussion. Xrays showed an apical lesion and absence of the periodontal ligament. The diagnosis was pulp necrosis/symptomatic apical periodontitis. 38-year-old male patient: No medical history, consulted for endodontic treatment of tooth 37 with an indication for rehabilitation. Clinically, a metallic restoration and mesial inclination of the tooth were noted. Normal response to the pulp sensitivity, percussion and palpation tests. X-ray evaluation of the tooth did not indicate apical lesion or thickened ligament; therefore, the diagnosis was asymptomatic pulp/normal periapical tissues. 25-year-old male patient: Referred for pain in the right mandibular region during the week prior to consultation. No relevant medical history. Clinical examination revealed deep occlusal decay in the right mandibular second molar (47). The response to pulp tests was exaggerated for both cold and heat; the response to percussion was normal. Radiographically, no apical lesion or widening of the space corresponding to the periodontal ligament was observed. The diagnosis was symptomatic irreversible pulpitis/normal periapical tissues. 55-year-old female patient: No relevant medical history, she was referred for endodontic treatment of tooth 46 indicated for rehabilitation. The patient did not relate any subjective symptoms. Clinical examination of the tooth revealed an occlusal-distal amalgam restoration. Normal response to sensitivity and percussion tests. The preoperative X-ray examination showed deep restorations, a retracted pulp chamber, normal periodontal ligament space and a complex root anatomy due to the presence of a radix entomolaris (Figure 1). The clinical diagnosis was asymptomatic pulp/normal periapical tissues. Figure 1: Case 1, tooth 17. 1A: Preoperative X-ray 1B: Gutta percha points adapted to the work length. The palatal canal has a Medium point, the vestibular canals Primary and the MB2 Small. 1C: Final Xray. Case 2, tooth 37. 2A: Preoperative X-ray. 2B: Gutta percha points adapted to the work length. Mesial root is a Small point. The distal canal is a medium point. 2C: Final X-ray. Case 3, tooth 47. 3A: Preoperative X-ray 3B: Gutta percha points adapted to the work length. Distal point is medium and both mesial points are Primary. 3C: Final X-ray. Case 4, tooth 46. 4A: Preoperative X-ray. 4B: Gutta percha points adapted to the work length. Mesial points are primary and distal points Medium. 4C: Final X-ray. In all cases, routine nonsurgical endodontic treatment was planned. The local anesthesia was induced using 1.8 ml of 4% articaine and epinephrine 1:100.000 (Articaine 100, Nova DFL, Brazil). A rubber dam was placed and the restorations in poor condition were changed for glass ionomer restorative material (Ketac Molar, 3 M, USA) to avoid filtrations where necessary. A conventional endodontic access opening was established with an Endo Access Bur® Nº 3 (Denstplay Tulsa, Tulsa, OK, USA) and an Endo-Z bur (Denstply Tulsa, Tulsa, OK, USA), both high speed; additionally, canals were located and accessed with an endodontic microscope (OM-100®, Ecleris, USA). The working length was determined using an apex locator (Raypex 6®, VDW, Germany) prior to permeabilization of each of the canals with a #10 K-file (Dentsply Maillefer, Ballaigues, Switzerland). The cleaning and shaping of the three root canals was done to working length using mechanized Pathfile® #13, #16 and #19 files (Dentsply Maillefer, Ballaigues, Switzerland) with continuous rotating and then reciprocating motion by means of the WaveOne gold system (Dentsply Maillefer, Ballaigues, Switzerland). The files were activated by an IQ® motor (Dentsply Maillefer, Ballaigues, Switzerland). The caliber of the WaveOne Gold master file was selected following the manufacturer’s indications. For narrow and/or curved canals the Small file was used (20.07), as in the secondary mesiovestibular canal (MB2) of the mesial root in case 1 and in the mesial root in case 2. For wide canals where apical calibration was not achieved with Primary files, the Wave One gold medium (35.06) was used, as in the palatal canal in case 1 and distal canals in cases 2-4. For all the other canals the Primary file (25.07) was used, which is in agreement with the manufacturer, who indicates that 80% of cases are worked with this instrument. Irrigation was done with a 5% sodium hypochlorite (NaOCl) solution (Asfer Chemical Industry Ltd, Sao Caetano Industry Ltd, Sao Caetano do Sul, SP, Brazil) between each filing. For the final irrigation, an EDTA 17% solution was used (Prime Dental Products Pvt Ltd, Mumbai, India) as a complement to the NaOCl, and both were activated with the EndoActivator® sonic frequency system (Dentsply Maillefer, Ballaigues, Switzarland). Obturation was performed by thermoplastic technique with the Elements Free® obturation unit (SybrondEndo, USA), using master Wave One gold Primary® gutta percha points corresponding to the master file of each canal and Top Seal® epoxy resin-based root canal sealer (Dentsply Maillefer, Ballaigues, Switzerland). The endodontic treatments were checked at 7 and 14 d, with the asymptomatic teeth persisting; they were therefore referred to their dentist for subsequent rehabilitation of the teeth. Novel technological advances have been incorporated into the manufacture of rotating endodontic instruments to improve resistance to fracture by fatigue or torque, including the use of new alloys, the application of different designs of crosssectional sections and the use of different kinematics . The WaveOne gold files are designed with a rectangular section to reduce the mass of the instrument and to provide space to release detritus from the root canal . This section uses one or two cutting edges, leaving two or three free to reduce the torsional stress on the instrument, avoiding taper lock or the “screw-in” effect . The reciprocal movement used by the Waveone gold system avoids the “screw-in” tendency through the asymmetric repetition of the rotations in clockwise and counter clockwise directions. This helps us to understand how the alternating movement shows better results than continuous rotation . It is worth noting that there was no “screw-in” effect of the instrument during the instrumentation in any of the cases presented here. The WaveOne gold system has been studied by some authors who have reported some of its features. Elsaka et al. reported that WaveOne gold exhibited greater resistance to torsional and bending resistance than the twist file adaptive and reciproc system . Similar results were obtained by Elnaghy and Elsaka  and by Adiguzel and Capar , who described the resistance to fatigue of the WaveOne gold instruments as being greater than that of the Reciproc and WaveOne instruments, respectively. This can be explained by the reciprocating movement traveling a shorter angular distance than a continuous rotation instrument; it is therefore subject to lower tension values and has greater resistance to fatigue . No instrument fractured in our cases, even when they were used in narrow and curved canals. All the files in available reciprocating systems are recommended for single use. However, a single use can include the preparation of at least 3 root canals in most molars . We used a set of files for each tooth treated as per the manufacturer’s instructions . The interruption of the movement of the file within the root canal is another factor to consider that can influence the resistance of the instrument. In reference to this, Keskin et al. determined that the resistance to cyclical fatigue of WaveOne gold Primary was not affected by the interruption of the procedure in contrast to Wave One Primary and Reciproc R25 . In our case, stopping the movement of the file during the procedure did not affect its effectiveness or its physical properties. Considering the efficiency of the reciprocating movement, the total time needed to prepare the canal was half that required for continuous rotation systems. We noted a drastic reduction in the time needed for the mechanical preparation of curved canals with only one instrument, which allowed us to spend longer on the chemical preparation using irrigants. At the same time, the single-use files of the WaveOne Gold system proved to be highly effective at cutting. This suggests that the alternative movement is superior not only in the half-life of the instrument, but also in its cutting efficiency, which is ultimately expected to reduce operator fatigue. In the literature, we have not found any articles that solve the question of the cutting capacity or deterioration of the files in this system. Future research should consider extending studies on this topic. WaveOne gold reciprocating single-file system represents an advance in root canal preparation. Their flexibility and cutting capacity make the mechanical preparation of curved canals safer, faster and easier than other instruments. In the cases we have described, the instrument was able to maintain the original shape of the root canal and did not present fractures in any of the cases. The time saved in the preparation can be dedicated to irrigation, which will help improve success rates. Hieawy A, Haapasalo M, Zhou H, Wang ZJ, Shen Y. Phase transformation behavior and resistance to bending and cyclic fatigue of ProTaper Gold and ProTaper Universal instruments. J Endod 2015; 41: 1134-1148. Elnaghy AM, Elsaka SE. Effect of sodium hypochlorite and saline on cyclic fatigue resistance of WaveOne Gold and Reciproc reciprocating instruments. Int Endod J 2017; 50: 991-998. Dentsply S. WaveOne Gold Brochure. Available at: https: //www.dentsply.com/content/dam/dentsply/pim/manufacturer/Endodontics/Obturation/Obturator s/Size_Verifiers/WaveOne_Gold_Size_Verifiers/W1G-Brochure-EN-jb8mf2z-en-1508.pdf. Plotino G, Grande NM, Testarelli L, Gambarini G. Cyclic fatigue of Reciproc and WaveOne reciprocating instruments. Int Endod J 2012; 45: 614-618. Karatass E, Arslan H, Buker M, Seckin F, Capar ID. Effect of movement kinematics on the cyclic fatigue resistance of nickel-titanium instruments. Int Endod J 2016; 49: 361-364. Ad?güzel M, Capar ID. Comparison of cyclic fatigue resistance of WaveOne and WaveOne gold small, primary, and large instruments. J Endod 2017; 43: 623-627. Varela-Patino P, Ibanez-Parraga A, Rivas-Mundina B, Cantatore G, Otero XL, Martin-Biedam B. Alternating versus continuous rotation: a comparative study of the effect on instrument life. J Endod 2010; 36: 157-159. Elsaka SE, Elnaghy AM, Badr AE. Torsional and bending resistance of WaveOne Gold, Reciproc and twisted file adaptive instruments. Int Endod J 2017; 50: 1077-1083. 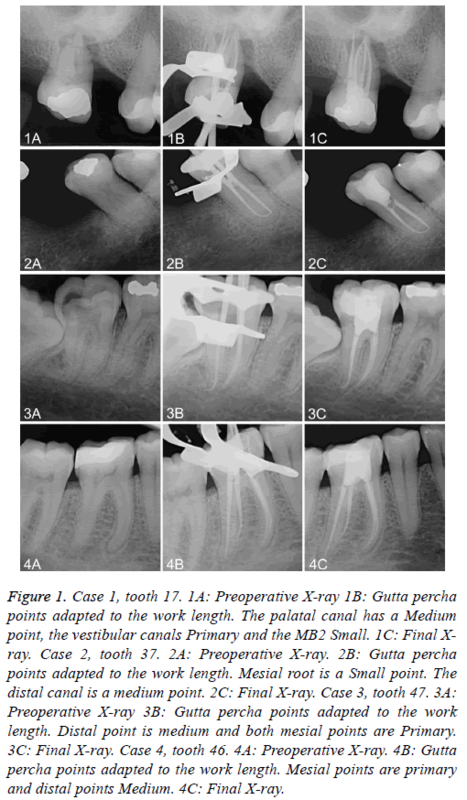 Gambarini G, Rubini AG, Al Sudani G, Gergi R, Culla A, De Angelis F, Di Carlo S, Pompa G, Osta N, Testarelli L. Influence of different angles of reciprocation on the cyclic fatigue of nickel-titanium endodontic instruments. J Endod 2012; 38: 1408-1411. Aracena D, Borie E, Betancourt P, Aracena A, Guzman M. Wear of the primary WaveOne single le when shaping vestibular root canals of first maxillary molar. J Clin Exp Dent 2017; 9: 368-371. Keskin C, Inan U, Demiral M. Effect of interrupted motion on the cyclic fatigue resistance of reciprocating nickel-titanium instruments. Int Endod J 2017.